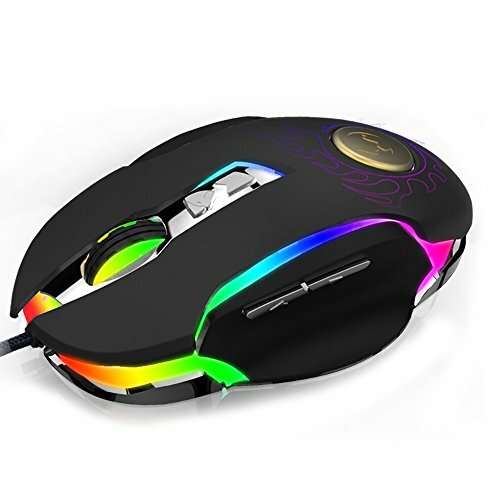 Mouse is very important to a professional gamer.Equip yourself with a great mouse and win in the game easily. custom game profiles,from 250 up to 4000 DPI 4 level DPI adjustment,and repositionable weights. Annwa A3050+ and MCU game chip,20 million OMRON switch,more precise positioning. Four gear shift (250-4000DPI,custom setting).Advanced anti-interference braid. Powpro PP-BM600 gaming mouse is designed for your game. The bottom of Powpro PP-BM600 gaming mouse is metal with advanced anti - interference braided wire. Colorful glare design,highlight the personality with metal element design. DPI Switching:Make the right moves in any game situation with up to 4 DPI settings from 800/1200/2000/3200 4 level adjustment or 250~4000 user-defined. Powpro PP-BM600 gaming mouse ergonomic right handed design that can keep your grip firm during gameplay. 6ft braided-fiber cable ensures greater durability. Most accurate and responsive optical sensor precisely translates hand movements onscreen,6600 FPS,20G ACC super fast game engine. Built-in intelligent power management system,if without operation of 15 minutes, the mouse will automatically enter sleep system,press any key to restore.